Wholemeal Barely, Barley Flakes, Wholemeal Spelt Flour, Barley Sour Dough (dried), Pumpkin Seeds, Barley Malt, Soya Flour, Sugar, Sunflower Kernels, Potato Flakes, Iodized Salt, Guar Flour E412, Spelt Sour Dough (dried), Albumen powder, Vegetable Oil (Rapeseed origin), Sodium acetate E262, Honey, Potato Fibre, Spices..
• Complete mix to produce barley bread, a typical compact German bread type. • Contains wholemeal barley flour, spelt flour, sour dough made from barley, potato flakes and pumpkin seeds. No wheat components added. 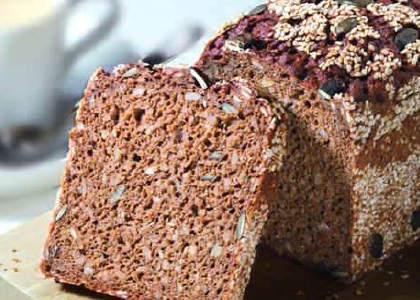 • The mild sour dough flavour combined with the barley aroma gives this bread its unique taste. Potato flakes provide a long lasting freshness. • Work up with moist hands, form the loaves, cover surface with a mix of sesame and pumpkin seeds and put into greased tins. • After forming the dough pieces cover with oat flakes and set into greased tins. Tip: handle dough with moist hands.